We’re sorry but we’ve just sold our last online store Jelli skort. 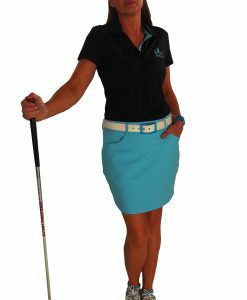 Both Cammeray Golf Club (02 9953 1522) and Manly Golf Club (02 9948 0256) still have limited stock of this skort so give them a call and see if your size is in stock! 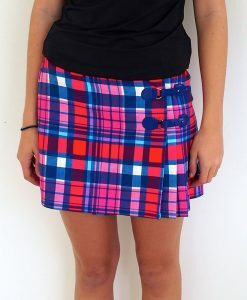 Pops of orange, pink and white against black make this gorgeous skort a ‘must have’. 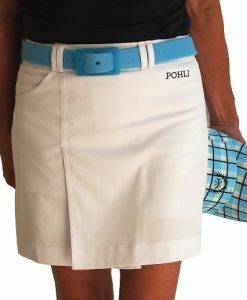 Simple, straight shape with chunky black zipper at bottom side seam. Includes built-in under-knicks in white. 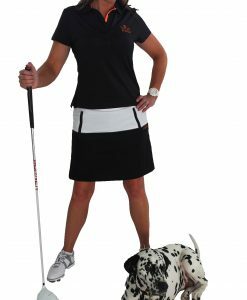 This skort has belt carriers and looks great with a Pohli belt in Rose, or Duo belt in White/Rose or White/Orange – with an orange visor to complete the look! Super easy-care viscose with plenty of stretch for comfort and wearability. Machine washable. 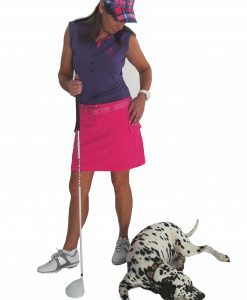 Includes Pohli’s easy to let down double hem, meaning you can lengthen the skort around 3cms without having to sew a stitch.